The credenza area features completely recessed LED pucks we installed into the "floating" soffit above each glass door to light the decorative elements inside. The existing soffit was also paneled to match the cabinetry in this Philadelphia, PA kitchen. The antique bench, colorful pottery in the built in credenza and elegant chandelier give this contemporary design in Philadelphia a warm personal touch. This contemporary kitchen in Philadelphia, PA features High Gloss Wenge and Stark White foil cabinetry. The large island features Cambria "Torquay" quartz engineered stone. 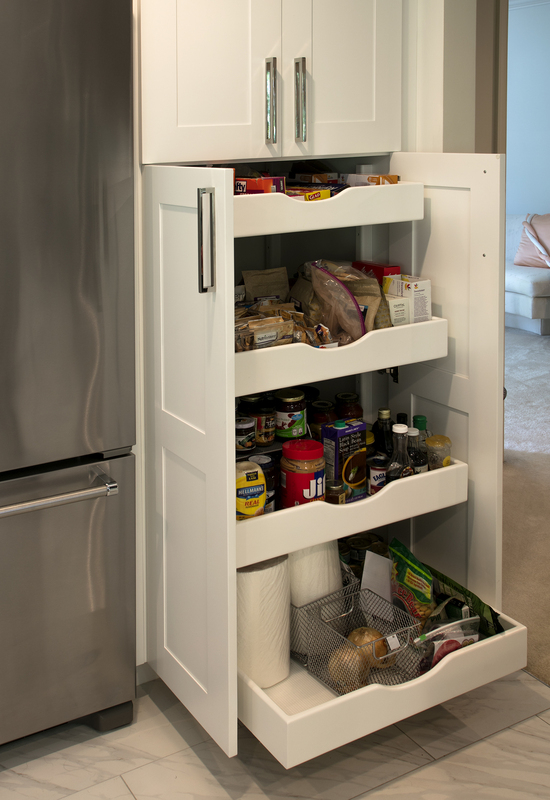 The refrigerator and freezer are built-in to blend in with the rest of the cabinetry. The floating shelves are also built-in and notched out to wrap around the exhaust hood. This contemporary Philadelphia, PA kitchen features OceanSide glass backsplash tile, as well as a Thermador cooktop, hood, and shelving, also with recessed puck LED’s. The island is featuring Cambria "Torquay" quartz engineered stone. The top extends down the side of the cabinetry to create a waterfall effect. This contemporary kitchen in Philadelphia, PA features High Gloss Wenge and Stark White foil cabinetry, with a large island and a eat in kitchen. The geometry of the colorful pottery that is displayed in the built-in credenza contrasts nicely against the contemporary cabinetry. American cherry with a clear, natural finish gives this contemporary design in Fort Washington, PA enduring presence. The new kitchen features Cosmic Black granite, reeded glass, Tech Lighting pendants, and handmade cherry stools. This contemporary kitchen in Fort Washington features cherry cabinetry, Cosmic Black granite, reeded glass, and Tech Lighting pendants that over look a newly added living space. A low profile retractable hood is the perfect complement to this American Contemporary kitchen and eliminates the more traditional and bulky ventilation system. This contemporary design features a hand-cut walnut travertine backsplash, American cherry cabinetry, three tall pantry storage units, an integral desk, and a paneled beverage cooler. The low profile retractable hood in this Fort Washington, PA kitchen is a big space saver and is easy to pop out with a push of a button. A grand entry into the newly created dining and living space in Fort Washington, PA. New energy efficient Pella doors and windows and Velux skylights brighten the space and create open views of the backyard. Shot of newly remodeled, year-round living space showing enlargement of exterior wall opening. The original 33” opening is now over eight feet wide creating a much more cohesive environment for entertaining. This contemporary addition in Fort Washington, PA features radiant heating under large format, tri-size porcelain tile, a mini-split wall-hung air conditioning unit, and new Pella windows and doors complete with mini blinds. White painted kitchen with modified Shaker doors with wide stiles and rails. Featuring Wenge gloss floating shelves with integrated LED lighting. Details: Routed in custom LED lighting in bottom of frameless cabinetry as well as interior side walls of glass door cabinets. White painted kitchen with modified Shaker doors with wide stiles and rails. Featuring Wenge gloss floating shelves with integrated LED lighting.Details: Island top featuring custom mitered 3” thick Black Galaxy stone. White painted kitchen with modified Shaker doors with wide stiles and rails. Featuring Wenge gloss floating shelves with integrated LED lighting. White painted kitchen with modified Shaker doors with wide stiles and rails. Featuring Wenge gloss floating shelves with integrated LED lighting. Details: Custom Wine bar with glass wall cabinetry and custom wine bottle rack. White painted kitchen with modified Shaker doors with wide stiles and rails. Featuring Wenge gloss floating shelves with integrated LED lighting.Details: Routed in custom LED lighting in bottom of frameless cabinetry as well as interior side walls of glass door cabinets.